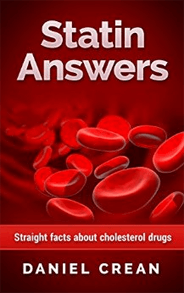 Statin drugs work by blocking a step in the body’s production of cholesterol. Cholesterol is a produced in the liver in a complex series of biochemical reactions – 25 reaction steps. Statin drugs block the enzyme critical for one step in cholesterol synthesis, HMG-CoA (3-hydroxy-3-methyglutaryl COA) reductase, thus inhibiting the liver's ability to produce cholesterol. This causes an increase in the number of low-density lipoprotein (LDL) receptors on the surface of liver cells, resulting in more cholesterol being removed from the bloodstream and a reduction in risk for high-cholesterol related diseases. Statin drugs have been shown to lower LDL levels from 18% - 55% and to raise HDL levels 5% - 15%. The reasons for the large range in these numbers is that people respond differently to medications and a number of different regimens were examined. Studies have also shown that statin drugs can help the body reabsorb cholesterol that has accumulated on the artery walls. Statins help with endothelial functioning. The endothelium is the thin layer of cells inside blood vessels. Endothelial dysfunction often leads to atherosclerosis and can signal other vascular diseases. Hypercholesterolemia is highly associated with impaired endothelial function. It is thought that statins help lower risk for coronary artery disease by inhibiting the production of cholesterol, thereby lowering the concentration of cholesterol in the blood and reducing the tendency of plaques to form on the blood vessels. An article in the Journal of the American College of Cardiology speculated on three possible mechanisms. Lipoprotein Load Hypothesis is that the statins, through inhibiting cholesterol synthesis in the liver reduce the amount of LDL-C and related lipoproteins in the bloodstream. Over time these fatty materials build up as plaque on the walls of blood vessels; so by simple reduction of cholesterol, statins result in less plaque and lower CVD risk. Systemic Inflammatory Hypothesis is that statins work like aspirin and reduce tissue inflammation around the bloodstream and everywhere. A simple blood test can measure levels of high-sensitivity C-reactive protein (hsCRP) in the blood; this protein is a biomarker of inflammation in the body, and when people take statins their hsCRP levels decline. Plaque Modulation Hypothesis is that the effect of statins is only at the blood vessel level and is very localized. The statins affect the plaques when they start accumulating on the arterial walls, making them more stable. In the long run this stability reduces the chances of plaque pieces breaking off and causing problems. Statins also have pleiotropic effects - for which they were not originally intended - related to the cardiovascular system. They reduce oxidative stress of body tissue; they reduce inflammation (like aspirin); and they stabilize plaque on the blood vessel walls. These effects operate independently of LDL-cholesterol reduction and unlike cholesterol reduction, they disappear quickly when the statins are no longer taken. Medical imaging has shown that the amount of inflammation reduction rises with increased doses. It is known that cardiovascular risks fall with increased more statins; this suggests the inflammation effect is what is really behind the benefits of statins. People who take statins are less likely to die of pneumonia and the flu. The antioxidative and antiinflammatory properties of statins may contribute to the improvement of prognosis in patients with coronary artery disease. Indeed, other common drugs such as aspirin have anti-inflammatory effects and much as aspirin can help with many maladies, there are indications that statins can have many benefits. There is conflicting evidence that shows that statin drugs may help prevent some types disease, including certain forms of cancer (such as colorectal or skin), by working against cellular functions that may be involved in tumor growth. However, there is also a significant amount of research which suggests that statins have no effect on cancer prevention whatsoever. Additionally, while preliminary studies suggest that the onset of Alzheimer's Disease may be affected by statin drugs and clinical trials to look into this question are underway, the efficacy of statins in preventing dementia has yet to be proven. The role of statin drugs in reducing the risks of other health-related issues is a contested topic, but statins have certainly been proven to be effective in fighting high cholesterol. It has also been suggested that statins could be used in fighting infection, much as antibiotic medications have traditionally been used. Indeed, a recent study found that people who use statins are less susceptible to sepsis and acute lung injury when they are patients in hospitals.